A phosphate group, in the context of biology, is a molecule composed of a phosphorous atom and four oxygen atoms. A phosphate group is part of many important biological molecules. 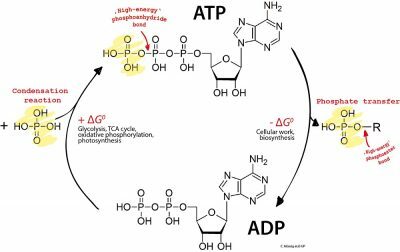 A phosphate group functions as part of energy-storing molecules, has an important role in the regulation of cellular metabolism, and is even a constituent of DNA and RNA. 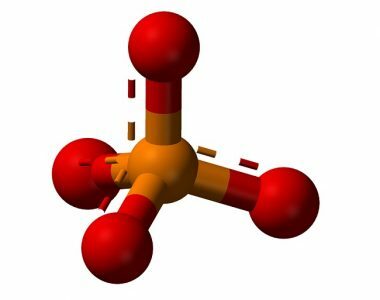 In its free state, a phosphate group is centered around the phosphate atom, with 4 oxygens surrounding it. These molecules are bound via covalent bonds, meaning they share electrons. The negativity of the oxygen atoms repels each other, pushing the oxygen molecules as far away from each other as possible. A typical free phosphate group would look like the following ball and stick model. One of the main functions of a phosphate group within cells is as an energy storage molecule. When a phosphate group is added to a molecule of adenosine, it becomes adenosine monophosphate, or AMP. This molecule is used in a number of biochemical reactions, and is heavily involved in both storing energy and as a second messenger in cellular signaling. When you add another phosphate group, you get adenosine diphosphate (ADP). This molecule has an additional phosphate group bound to the first, and stores energy in this bond. 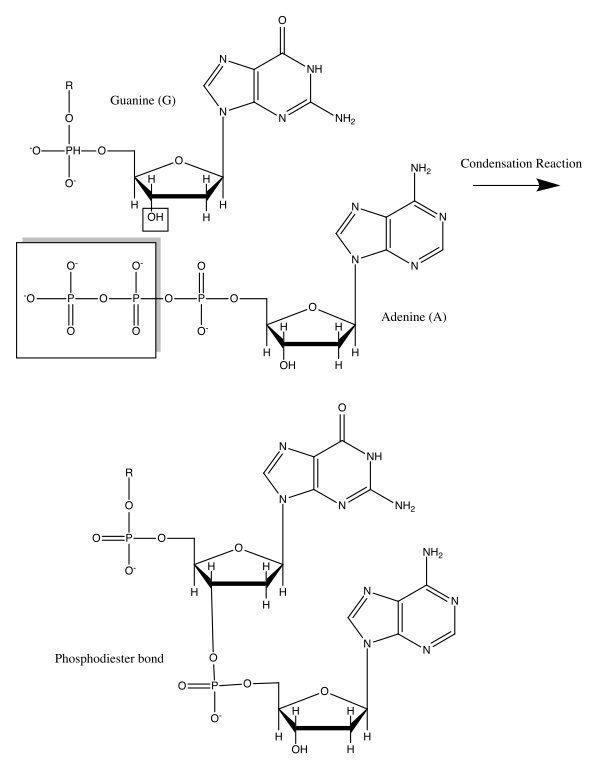 This ADP molecule can accept another phosphate group, and become adenosine triphosphate. Commonly called ATP, this molecule can transfer the third phosphate group to a number of enzymes, activating them or imbuing energy to some process. 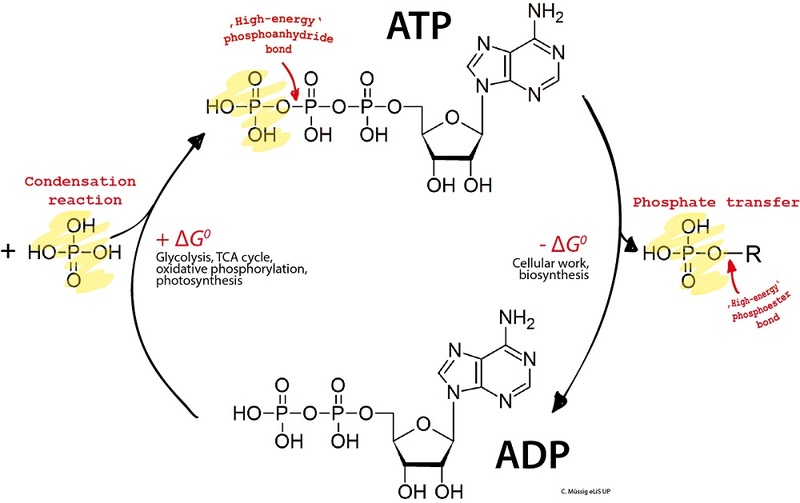 You can see the recycling of phosphate groups between ADP and ATP in the diagram below. Phosphate groups are one of the most important cellular components. Unfortunately for organisms, it is primarily based on a source of phosphorous atoms. This is the reason phosphorous is commonly a limiting nutrient. It is commonly a component of fertilizer for agricultural crops, which allows both the plants and the microorganisms in the soil to thrive. A phosphate group is also a key component of life itself. A constituent of deoxyribonucleic acid is a number of individual phosphates. DNA is composed of individual units, called nucleotides. Each free nucleotide has two additional phosphate groups, which will be used in the reaction binding it to the DNA chain. The process can be seen in the following diagram. Each nucleotide contains a nucleotide base (A,T,C, or G), a sugar (deoxyribose), and a phosphate group. The chain of DNA is formed by bonds between the phosphate group of one molecule to the sugar molecule of the next. 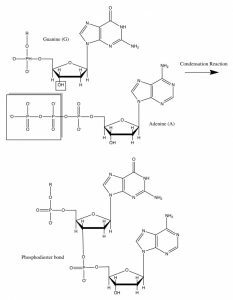 These series of phosphodiester bonds become the sugar-phosphate backbone of the molecule. This is also true of RNA, but the sugar is different (ribose). Another major function of a phosphate group within biological systems is as part of the cellular messenger, cyclic adenosine monophosphate. Also known as cyclic AMP, or simply cAMP, this molecule is used in a number of signal transduction pathways. Signal transduction is the process of transmitting a chemical signal through the cellular membrane. It involves a number of proteins, and often a phosphorous group or two. Typically, a signal transduction pathway starts by a chemical arriving at an integral membrane protein. These proteins cross the cellular membrane. When the protein is activated by the chemical, it changes shape slightly, activating another enzyme inside of the cell membrane. This enzyme, adenylate cyclase, uses the energy from two phosphate groups of an ATP molecule to produce a cAMP. These signal molecule then affect a number of other proteins, channels, and enzymes, leading to an overall cellular reaction. This use of a phosphate group (or many) is seen in many cellular communication channels. A phosphate group is also a component of the lipid bilayer which creates cellular membranes. Each phospholipid molecule within the bilayer has a phosphate group at the head of the molecule. The phosphate group is hydrophilic, attracting the head of the molecule towards water. The hydrophobic tails are collected together, forming a semi-permeable membrane which separates the contents of the cell from the outside. A free phosphate group within the cytoplasm can also act as a buffer, attaching to strong acids or bases, and decreasing their effect on environment as a whole. This helps cells maintain an regular and consistent pH, and allows cellular processes to evolve. 1. Which of the following is a use of a phosphate group within a cell? 2. How can a molecule (such as ATP) store energy? 3. Why is a phosphate group an important part of DNA? A. It isn’t, there’s no phosphorous in DNA!